wolf and Anne & all who drop in later. That sounds like something my grandkids would do Anne. I would do it to them too! Maen, all. To all in SE US stay dry ! Wet here. 1.4 inches (3.6 cm) so far. Has been a bit of both sun and non-sun so far today. everybody. Hello possums, got any gladiolies about? 2:29 Floundering about. Anne - Congrats on the missing link! Just a quick check-in. I am off to the ophthalmologists in a few minutes. Hubby just got a new lap top and is hassling with the tech people trying to get it set up. ''hassle'' being the operative word. I am happy to leave him to it and escape. all. It has been quite dreary/rainy here for an extended period (after a period of no rain), but nothing like others are getting east of here. Guess I won't complain, but I sure wish my sinuses would settle down. HER?? Man, they make them women TOUGH in Texas! Again, back just at the right time. Another cloudless sky day to wash & thankfully dry some of the patio umbrellas before storing them for that next season … when we surely have no need for them! Have a grand day everyone despite what your sky offers...…. Our possums are different here, but this one sure is cute. Morning all,we had a possum this size visit our camp site at Tara, QLD. One of our group,a young man from Indonesia,was so excited as he hadn't seen one before. 1:49, felt slower. Good morning everyone. That possum looks like a small bear! Funny that it has the same name as North American possums. Google here I come, to find out if those two animals are even related. We have frequent visits from possums. At one stage we bought a possum home (a hollowed out log) to try and keep them away from our plants. We thought it was a tight squeeze until we discovered there was a mother and her quite well developed baby were both in there. We subsequently moved it closer to the house only to discover that a colony of bees had decided to colonise it. Not to worry, the grandson of a friend had several hives and kindly relieved us of the possum nest. After all that typing I need some refreshment. I think a Carlton Light will do, seeing it is so early in the morning. For those who are interested, the possum in the picture is a brush tail (although that is not in evidence). 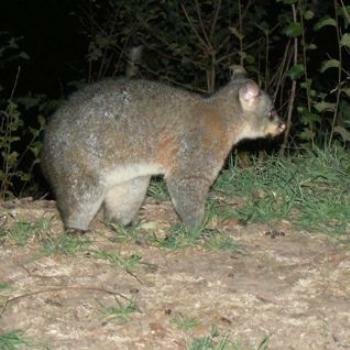 There are a number of other possums, the most common of which is the Ringtail, Leadbeater's which is on the endangered list and the Sugar Glider which is threatening to wipe out the critically endanger yellow bellied parrot by stealing their nesting site, and maybe eating the babies. Many people regard the Brush Tails as pests, but their options are limited because they are protected. So people trap them and relocate them, only to find that they return even though they have been taken miles away. That makes a CP. it looks like a big possum...glad they don't live in Canada. We have the (marmotte) Groundhogs...lower on their feet but just as big... they are not suppose to be dangerous but one day, when I was in my driveway, came face to face with one...we both froze up for a while then I very slowly moved out of his way... since then I carry a broom in my car.